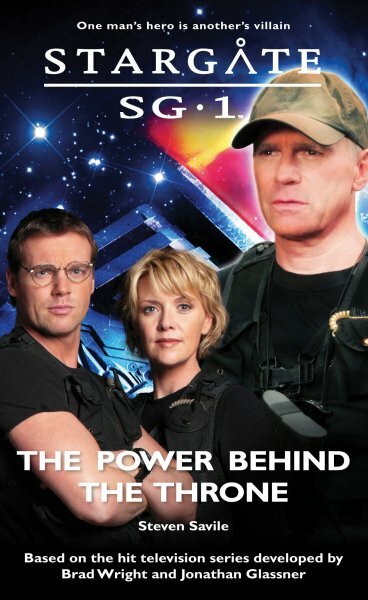 When the Tok’ra ask SG-1 to save a tortured creature from the clutches of Apophis, how can they refuse? But the Mujina is no ordinary being — devoid of face or form, it draws its identity from those around it. All things to all people, it is a creature with terrible potential — for both good and evil. Their pursuit of the Mujina takes the team to a nightmarish world where human wickedness is at its worst — and there, the creature finds its home. Captured by the ethnically pure Corvani, Colonel O’Neill’s team must confront the planet’s insane leader, the Raven King, as well as a more familiar and insidious enemy. Fifty feet from the gate the blue water of the event horizon ripped out of the aperture. The way home was open. O’Neill had done it. Teal’c saw the colonel go down again. The sucking silence that followed was hideous. Then both Carter and Daniel Jackson were yelling — this time the sound was primal and filled with fear for the fallen O’Neill. Teal’c ducked beneath a wild burst of fire from a Jaffa weapon, and ran, hard, fast, keeping low, his arms and legs pumping. A burning man staggered across his path. The flames consumed him, turning his flesh to blistered sores. Teal’c fired once, putting the Jaffa out of his misery, and was past him. He ran to O’Neill’s side and gathered him into his arms. The colonel shuddered once, violently, and opened his eyes. “Go!” he rasped. “Indeed,” Teal’c said, rising. He watched Daniel Jackson’s back disappear through the gate and followed him. “We do not leave men behind, O’Neill. That is the law. But O’Neill had lapsed into unconsciousness.